Sikh observances revolve around anniversaries of the 10 Gurus who developed the faith’s beliefs. All the Sikh Gurus taught compassion, love, dedication, hard work, worship of one God, and commitment to world peace. Their birthdays, called Jayanti, Gurpurab or Prakash Utsav, are occasions for celebration and prayer. Holy days and events generally follow the Nanakshahi calendar, a 12-month solar calendar in use since 1998. The Shiromani Gurdwara Parbandhak Committee, the Sikh governing body, adopted it in 2003. About 90 percent of the gurdwaras (Sikh temples) worldwide follow the calendar. The Sikh New Year falls on the first of Chet, the first month of the Nanakshahi calendar (March 14). The calendar’s epoch is the birth of Nanak Dev, founder and first Guru of Sikhism, in 1469. While Holi is a playful event, on Hola Mohalla Sikhs demonstrate their martial skills in simulated battles. During the festival, celebrants move to a given spot in army-style formation, accompanied by war drums and standard bearers. Guru Gobind held the first such mock fight in February 1701 at Anandpur. Vaisakhi (also spelled Baisakhi), the first day of the month of Vaisakh, is a major harvest festival and religious observance for Hindus and Sikhs. For Sikhs, the day commemorates Guru Gobind Singh’s founding of the Khalsa warrior community. On Vaisakhi Day 1699, the Guru baptized the Khalsa’s first members, the Panj Pyare (Five Beloved Ones). These five followers showed their willingness to sacrifice their lives for the faith. Guru Gobind gave the Khalsa a unique identity with five distinctive symbols. These Five Ks are kesh (uncut hair), representing holiness and simplicity; kara (steel bracelet) for self restraint; kanga (wooden comb) for a clean mind and body; kaccha (cotton underwear), readiness for battle on horseback; and kirpan (sword), the obligation to defend oneself and those in poverty and oppression. Vaisakhi is celebrated worldwide and especially in India’s Punjabi region. 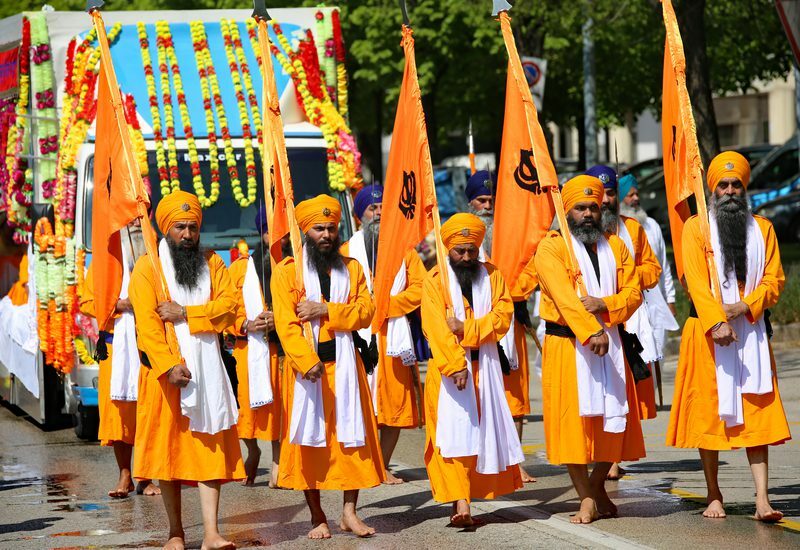 The most important custom is Nagar Kirtan, a procession led by five men with orange banners representing the Five Beloved Ones. 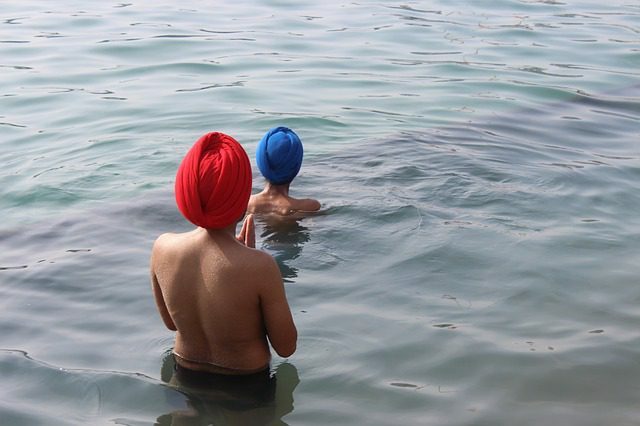 Sikhs visit the gurdwara with offerings, bathe in sacred pools, attend kirtans (musical programs) and perform community service. This day marks the death of Guru Arjan Dev Ji, the fifth Sikh guru and first martyr, on 2 Harh (June 16). Guru Arjan Dev Ji was arrested under order of the Mughal Emperor Jahangir. When he refused to convert to Islam, the Guru was tortured for several days. He died on Jeth Sudi 4, Samvat 1663 (May 30, 1606). Sikhs honor Guru Arjan for compiling and contributing about 2,000 verses to the Guru Granth Sahib, the Sikh scripture. 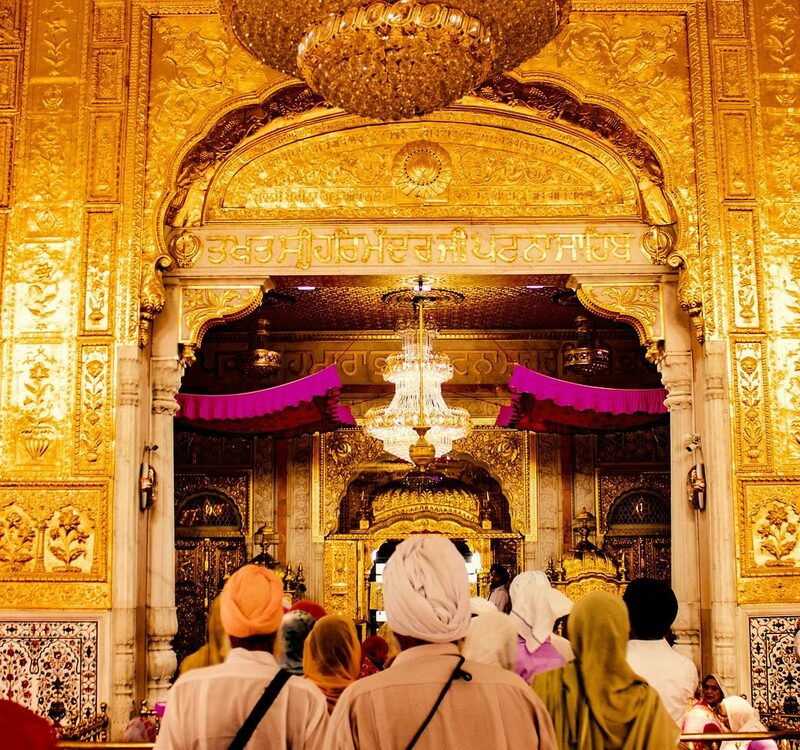 They also remember him for building the Harimandir Sahib, also known as the Golden Temple, in Amritsar, India. 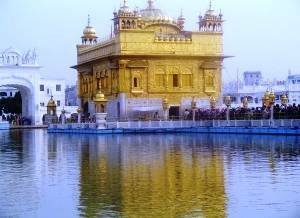 To emphasize that Sikhism was open to all, regardless of caste, he constructed the temple with doors facing all four directions. 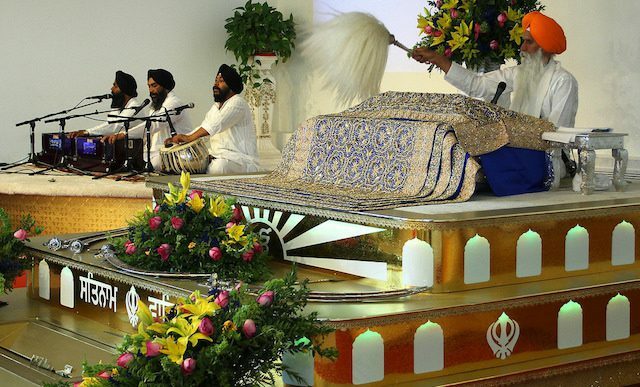 First Parkash (opening ceremony) of the Sri Guru Granth Sahib, the main Sikh scripture, is observed on September 1. The Granth, or Adi Granth, is a collection of prayers and hymns. The fifth Sikh guru, Arjan Dev Ji, compiled words and verses from all the Sikh Gurus and other saints to create the Granth. When Guru Arjan finished compiling the Granth’s 1,430 pages and 5,864 verses, he placed it in the new Harmandir Sahib in Amritsar. He performed the first parkash there on 1 Bhadon Sudi, Samvat 1661 (August 30, 1604). The Adi Granth was a turning point for the Sikh faith, marking its separation from Hinduism and Islam. 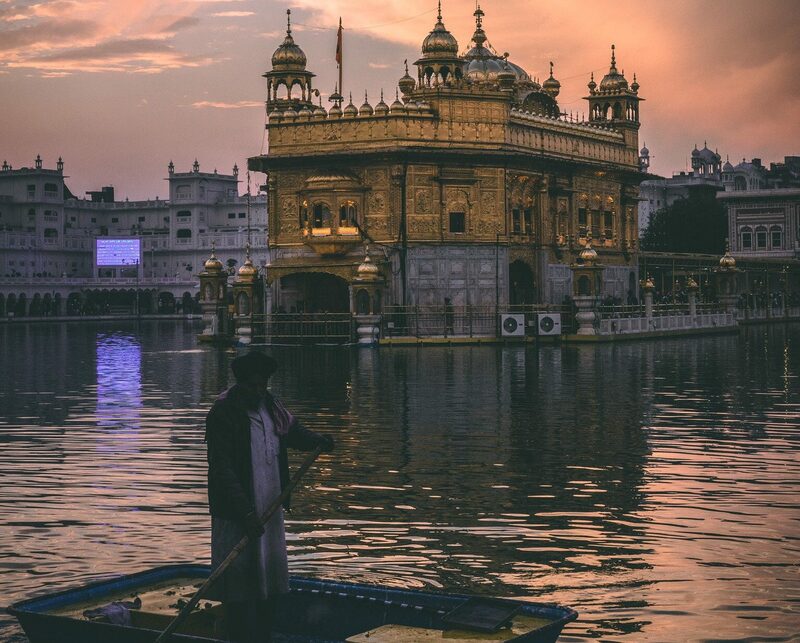 After Arjan Dev installed the first edition of the Adi Granth in the Golden Temple in 1604, rivals later stole it. Gobind Singh—the 10th and last human Sikh Guru—took on the task of recreating the entire scripture. Guru Gobind dictated all verses he considered revealed, including verses written since the first edition, to a Sikh scholar. The project took almost five years and was completed in 1705. On October 20, 1708, Guru Gobind gave his last sermon and conferred permanent gurudom on the second edition of the Granth. Since then, the book has become known as Sri Guru Granth Sahib. Sikhs view it as their perpetual living Guru and guide. Believers do not worship the scripture but treat it with reverence for its wisdom and spiritual teaching. They stand when the Guru Granth Sahib is brought into a room. In gurdwaras (houses of worship), Sikhs keep the scripture on a raised platform and open, read and close it ceremoniously. Bandi Chhor Divas (“Day of Liberation”) is a holiday that coincides with the Hindu festival of Diwali. Sikhs have historically celebrated Diwali and Vaisakhi with Hindus. In the late 20th century, Sikh religious leaders began calling the day Bandi Chhor Divas. In 2003, the Shiromani Gurdwara Parbandhak Committee, the Sikh elected leaders, adopted the name along with the Nanakshahi calendar. The holiday celebrates the release from prison of Guru Hargobind, the sixth Sikh guru, in 1619. According to tradition, Emperor Jahangir agreed to release the Guru, who asked him to also free 52 Hindu kings imprisoned with him. The Emperor agreed, but limited the number by releasing only those prisoners who held onto the Guru’s cloak tail. However, the Guru had a cloak made with 52 panels attached, so each king could hold onto it and leave. Guru Hargobind arrived in Amritsar a few days later on Diwali. 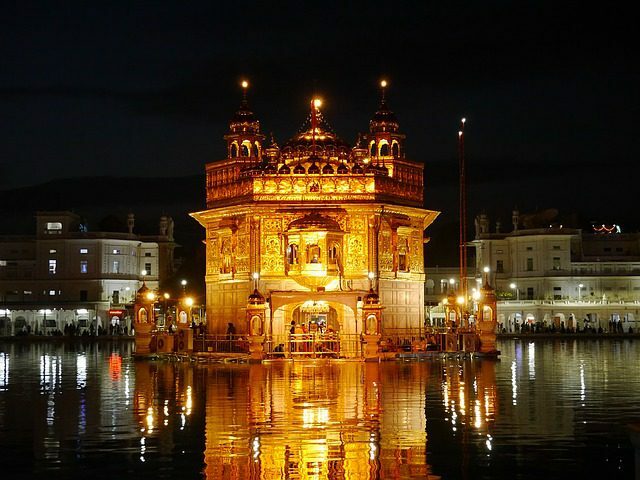 In celebration, the Golden Temple and the entire city lit up with lamps and candles. Sikhs continue this tradition of lighting homes and temples on Bandi Chhor Divas. They also exchange gifts and feast with family and friends. Sikhs honor the birth of Guru Gobind Singh, the 10th and last human Guru, on 23 Poh, or January 5. (Some regions observe it according to different calendars). He was born in 1666 at Patna Sahib, India, and became the Sikh leader at age nine after his father, Guru Tegh Bahadur, was executed by the Mughal emperor. Guru Gobind is revered as a devout spiritual leader who made major contributions to Sikh ideology and writing, as well as a fearless protector of all people from oppression and injustice. 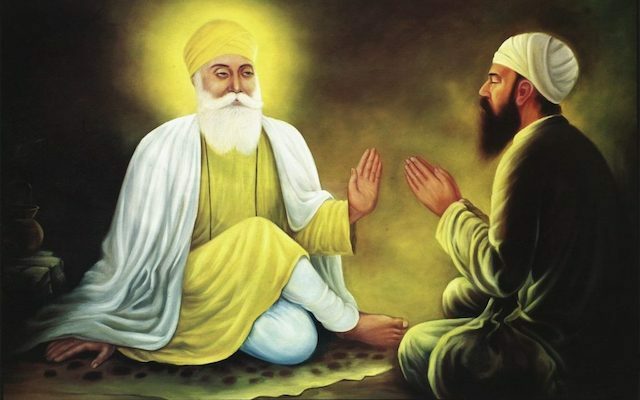 He initiated the Khalsa community[https://theguibordcenter.org/faiths/sikhism/sikh-festivals-and-observances/#baisakhi] to stand against injustice and named the Adi Granth as the final, eternal Guru and spiritual authority of Sikhdom. Sikhs celebrate the occasion with processions and singing, gathering at gurdwaras for prayer and spiritual discourse, and reciting poems and hymns. 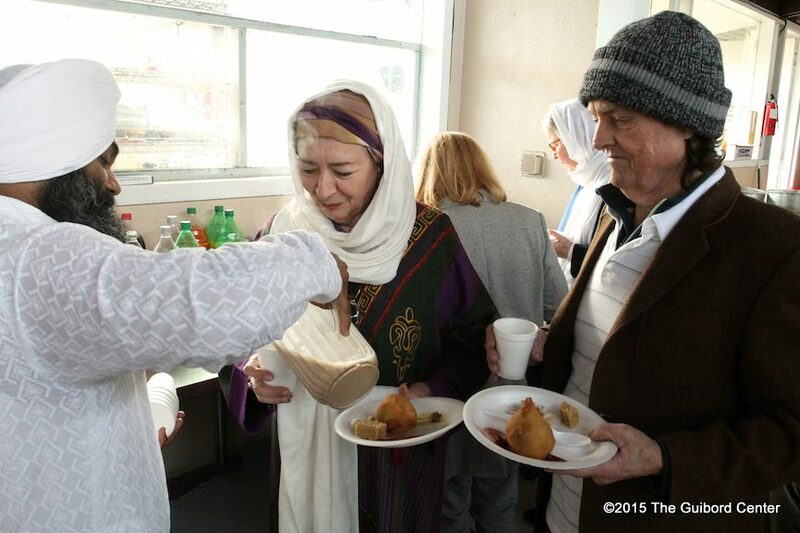 A langar (community meal) is also prepared for believers. Maghi, also called Makara Sankranti, is the first of the month of Magh. 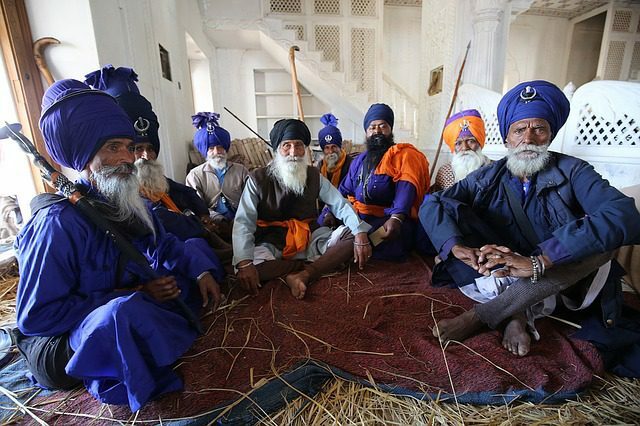 Sikhs and Hindus both celebrate the day, especially in India’s Punjab region. In Sikhism, Maghi honors the martyred Chali Mukte (40 Liberated Ones), who died as they resisted a military attack on Guru Gobind Singh. The battle took place on 30 Poh (December 29) in Muktsar, Punjab in 1705. The fallen were cremated the next day, 1 Magh, which generally falls on January 13 or 14. Observances include recitals of the entire Guru Granth Sahib, bathing in holy water, charitable giving and eating kheer (sweet rice porridge). The largest celebration takes place over three days in Muktsar. Believers bathe in the sarovar, or sacred pool, and visit shrines associated with the battle. On the third day, they walk together from the main shrine to the Tibbi Sahib gurdwara, sacred to Guru Gobind.